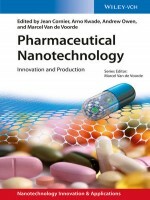 With its focus on concrete methods and recent advances in applying nanotechnology to develop new drug therapies and medical diagnostics, this book provides an overall picture of the field, from the fundamentals of nanopharmacy with the characterisation and manufacturing methods to the role of nanoparticles and substances. Actual examples of utilization include drug development issues, translation to the clinic, market prospects, and industrial commercialization aspects. The applications described are taken from cancer treatment as well as other major therapeutic areas, such as infectious diseases and dermatology. An in-depth discussion on safety, regulatory, and societal aspects rounds off the book. Written by a top team of editors and authors composed of the leading experts in Europe and the USA who have pioneered the field of nanopharmacy!